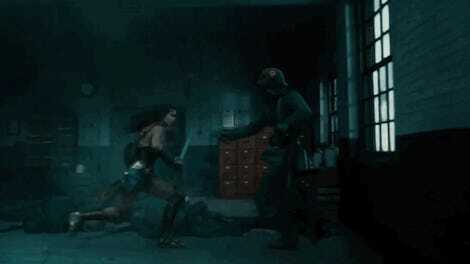 I’m all for Chris Pine cracking jokes and being rescued by a kickass Gal Gadot all the time in Wonder Woman, which basically means the movie just needs to be different versions of this new clip over and over again. The snippet aired on last night’s Jimmy Fallon, as part of an interview with Chris Pine, and sees Diana use her bracelets to full majestic effect coming to Steve’s aid when they get surrounded by sinister goons in an alleyway. We’ve seen parts of this clip in trailers before, but in the full context, it’s a lovely bit of fun. Although Steve carries all of the banter here—and he’s a pretty good at it—it’s still a joy to watch Diana spinning around, deflecting bullets, and punting goons halfway across an alley. That, and the homage to Richard Donner’s Superman with the bullet deflect is always nice to see. This is the exact sort of tone we want out of this movie.